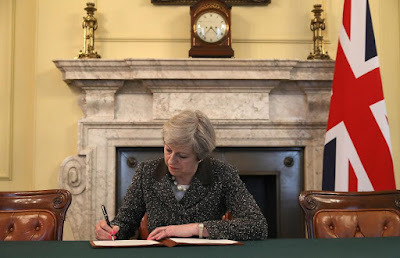 March 29th 2017 was the date that the United Kingdom, in the form of its Prime Minister, Teresa May, formally notified the European Union, by letter, of its intention to leave. The UK is split down the middle by the plan, with a fraction over half voting 'for' and just under half voting 'against'. But within the ruling Conservatives, a resurgent nationalism and indeed triumphalism dominates. And this is what first stands out about this carefully prepared and balanced image. The very dominant ‘Union Jack’. Now British politicians do not usually cloak themselves in the national flag—it used to be considered inappropriate, a usurpation. The flag has also been for too long associated with 'unacceptable' political parties, like the National Front, who stood for Parliament (and fought in the streets) on an openly racist platform about expelling 'other races' from the country. But now a Prime Minster with a very similar platform, expelling European ‘migrants’ from the country, involving a backward-looking and divisive notion of Britishness, is actually in power. Mrs May sits exactly in front of a marble fireplace. Marble sends subliminal messages about wealth and importance. But it is also the stone of cemeteries and mausoleums. The British Prime Minster wears a black outfit, which despite the white speckles does not quite manage to dispel the funeral feel. Mrs May used to be a banker, working at the Bank of England and the Association for Clearing Payment Services. But here she looks less like a banker and more like a lawyer, signing a Very Important Document, such as a death certificate. And so in a sense it may actually turn out to be—for her Brexit programme could be the death of the United Kingdom. The observations on the photo are interesting. But first impressions were that this Picture Post tends to subvert itself. Nationalism is shunned, yet British preoccupations take centre stage in a post which is written for an 80-90% non-British audience. We find that something quintessentially British, namely the Union Jack and Her Majesty's First Minister, is labelled a 'historical moment', while any and every other historical party is marginalised, in fact excluded from the post. The post shuns a 'backward-looking' mentality, while at the same time it longs for a previous political order which is pre-Brexit. One could continue along much the same lines with the ideas of democracy, isolation, wealth, and so on. In short, first impressions were that this post covertly espouses that which it overtly eschews. A striking aspect of the image is the aloneness of Prime Minister May. 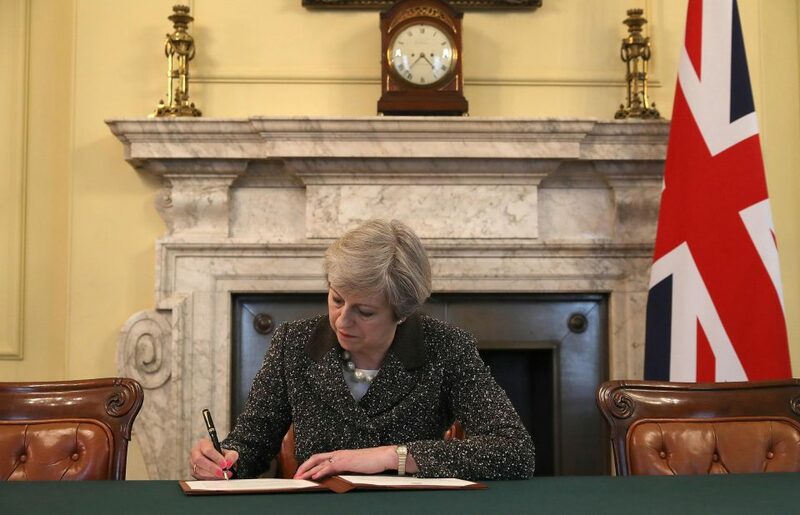 Her isolation — surrounded only by things, not people — is made all the more arresting by the fact she’s engaged in what’s supposed to be a momentous act, the signing of Brexit’s Article 50. If there were a sense of glee, or even just simple equanimity, within the government and nation regarding the act, one might expect May to be surrounded in the photo by an entourage, all gleaming in a celebratory mood. But she’s not. It’s evidently not a time to demagogue or, more lightly, even pop champagne. There’s at most a wan attempt, with the flag at the prime minister’s side, to present a ‘UK first’ aura. But I wonder how many people gazing at the photo are convinced. Perhaps the specter hanging over May as to the long-term outcome of Brexit is sufficient cause for pause. There is no handy, robust algorithm for reliably figuring whether the exit from the EU will prove a boon or a bust for the UK. Or how the impact (trade and otherwise) might bear on other, even non-EU nations. Among other things, there are simply too many variables — and much that’s outright unknowable — to control for in charting out with confidence any future course that might be associated with sunny ends. The field of economics is of little help in this regard; it offers no obvious, assured bridge to what’s next or how to get there. One wonders if the UK or the other twenty-seven members of the EU ultimately hold the most aces as they try to come to an accommodation. Whether austerity or prosperity looms over the horizon is unknown, perhaps accounting for the prime minister’s straight-faced demeanor here. Either way, the lot has been cast. In order to make sense of the image, one has to set out the context. A similar exercise would be necessary to describe any scene, especially one drenched in local political imagary. But this is our picture post, so the economics is not really at issue. I do think you've put your finger on several points here: the picture conveys isolation, the uncropped version of the press handout image has about six empty chairs! I assume even Mrs May knows a celebratory note would look askance... She intends to convey quiet determination.. but yet - is there not that funereal quality? I agree, Martin, there is certainly a funeral quality to the picture. One might be inclined to think of it as a "funereality" being sealed. Thanks, Martin, for the link to your other article on Brexit. You’re obviously passionate about — and informed on! — the subject. My larger unease stems from when economists read the runes in order, with undoubtedly good intentions, to divine the future. Econometrics is awfully tricky, and humbling — all the more so when attempting to discern and attach numbers to future trends and economic indicators. My point is that, likewise, I suspect we’re on wobbly grounds when it comes to fathoming what the runes disclose about the long-term effects of Brexit’s gyrations. What’s ensuing is a one-off, which, I suggest, makes hypothesizing and modeling how Brexit will play out a truly thorny undertaking. The longer the timeline, the less certain the projections. I have to believe there will be major spoilers seeded along the way. It's certainly a situation with multiple interacting factors, which makes 'linear' thinking dangerous. But I do still think that given a long enough run, the implications of complicating and damanging trade links with Europe and writing off things like the UK's role as the European centre for finance are just lose lose policies. Thanks, Christian. Mrs May is wasted in politics... she could have made a fortune as an undertaker! The difficulty with such a picture like above, is to think away what the pictured person represents, and more over this is emphasised by her environment. Different would be Mrs. May in her pyjama’s toasting bread in the kitchen. So there is this strange addressing we hand to images; above, a prime minister who represents a nation, and in the second example a woman, a human being that everybody would recognise as such. The observation here is that as soon as political aspects ‘drain' the image, the context for a picture post becomes as such, and politics move opinions. "Nationalism is war," a French president candidate said. ... and John Adams, second President of the United States, once described it as: a dreadful ‘hobgoblin’, ‘so frightful... that it would throw a delicate person into fits to look it in the face’! Interesting deconstruction by BBC of the photo. The situation inside and outside the administration is highly fluid, with almost-daily gyrations. But with that important caveat in mind, what strikes me about the war-room photo is the arguably telling triangulation between national security adviser H.R. McMaster (centered at the table), senior adviser Jared Kushner (centered at the table), and strategist Steve Bannon (not at the table). As one reads the media tealeaves, the first two have the air of ascendancy in the administration, with growing portfolios; and the third seems descendent — overall buttressing the significance of that triangulation. Underscoring the fluidity is that senior adviser Stephen Miller, who’s barely seen off to the side, near Bannon, is one person whose star may well rise in the coming weeks, finding a place at a future war room table. But putting all that insider jostling aside, and taking the 30-thousand-foot perspective of the political carryings-on since January, the critical ‘checks and balances’ the founding fathers sagely built into the system two-plus centuries ago — among the executive office, the Congress, and the courts — thus far appear to have gamely held up under the whipsawing and done their prescribed job.